In July, we were officially initiated into the grand world of canyoneering. My LOWA's took a licking and kept on kicking, wading rivers, climbing rocks, rappelling over waterfalls, and squelching in Utah mud. Summary: in a whirlwind trip, we flew and drove to accomplish a week's worth of Zion NP play in just three and a half days, including two world famous canyoneer hikes — the Narrows (partway) and the Subway. Thursday night, our posse of six flew to Vegas, where we picked up rental cars and hit the road. By Friday morning, we had crossed the Nevada/Arizona border and the Arizona/Utah border within an hour, and were entering Zion. The weather was gorgeous and fairly clear, although the faintest clouds threaten thunderstorms in the Southwest. Our first hike was to Emerald pools, an easy, 5 mile hike to see pools and waterfalls. A professional-looking photographer was working hard, ankle-deep in muck, at the upper pools. He had LOWAs too! The next morning, thunder struck. Lightning flashed, rain poured. It seemed like canyoneering that day would have been impossible. Nobody in their right mind would be anywhere near a canyon. Power was going out all over the area, and rangers were roaming around, keeping folks away from waterways. 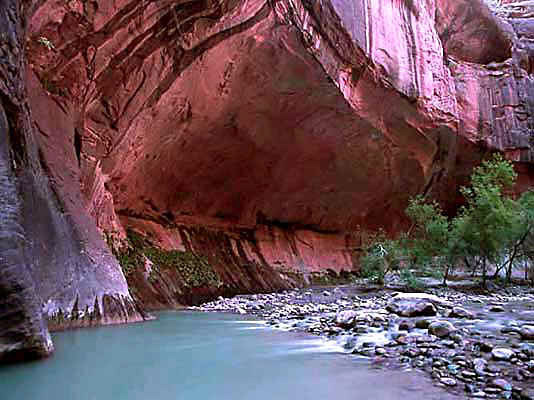 The slot canyons would be treacherously full of rushing water, rocks, trees. Just an hour or so later, the storm broke and the clouds blew away. So we hopped on the park tram (which runs through the whole park -- excellent idea) and went to the mouth of the world famous Narrows. Along with all the tourists, we waded up the first four miles of the Narrows, with a close watch on the sky. Most of the water was about knee deep, and not moving terribly fast. The best thing to wear is a pair of dayhikers (like the LOWA Renegade mids) to protect toes from rocks and support ankles as you cross uncertain, slimy terrain underwater. We reached the classic Narrows section, where the canyon narrows nonstop for a one-mile stretch, reaching a significant junction with another tributary slot canyon, much narrower (about 15-20 feet wide), called Orderville. Just around the bend lie the most classic section of the Narrows, where the walls close in to about 15 feet wide and thousands of feet high. We saw overnight backpackers hiking out; the stormy morning did not make them too happy. Clouds were passing in large masses over us, and getting darker. The walls of the Narrows at the Orderville confluence, thousands of feet high and about 20-30 feet apart, were creating an echo of rushing water that made any thunder impossible to hear. Trees were jammed by flash floods in the rocks hundreds of feet up, bridges to nowhere. We reluctantly turned back downstream. Little did we know the current had nearly doubled since we began our hike (due to rain-related drainage upstream). We could feel the air pressure building for another Thunderstorm. In the safe, wider sections of the river, we found a couple wonderful swimming pools, including one with a wonderful boulder for cannonball dives. We splashed downstream, eventually back to the tram and hotel, when thunder started to roll, confirming our cautiousness. By darkness, we were watching a spectacular, thunderless lightning show. It lasted about half an hour, lighting up the entire sky so we could see where the rain was pouring like a giant flume directly over the Narrows, with dramatic rocky peaks sillouetted. The greatest adventure of all was still ahead of us. The next day, the weather was perfect — so comforting and balmy and not the least bit threatening. This hike was an ambitious 9.5+ miles of serious, semi-technical canyoneering, with some scrambling, swimming, rappelling, and map-and-compass navigation mixed in. A famous canyon called "The Subway," required a complicated two-car spot, one at the top of the hike, one at the bottom. The drive to the trailhead was spectacular, entering the more remote "Kolob" wilderness of the park. We passed incredible rock formations towering above us, mixed with dark green pines and pristine yellow fields of grass and flowers. The hike started with a calm descent and minor route-finding in an low profile alpine forest, dense lush with ferns and flowers and small creeks. We then descended a gorgeous red slickrock mountainside, one huge, striated, wavy red rock formation. Sharp downhill, tough on the quads. The Renegades held like glue. We then climbed/smeared up slightly over a saddle/hoodoos, and came eventually to the first sharp descent into the slot canyon, which was a teetery scramble down a dirt, roots and rocks cliffside. Down we went and we emerged into the first major gorge of the Subway. Rock walls began to become rounded, arched overhangs about 20 yards across, with streams and waterfalls here and there — almost a tunnel in places. Eventually, we came to our first swim, across a long, 15-foot wide, bottomless pool of still, black water so cold it stole your breath — literally. It helped to make noises going in. Even our trekking poles were too short to touch bottom. I was the first to experience the cold, feel out the footing, and find all the shin-bonking rocks underwater. In places, the pool was ear-deep for me. We had to carry our packs over our heads like Navy Seals. But that was just the beginning of the technical challenges. The next pool we came to was much more challenging at first. Water funnelled into a "keyhole" - a deep hole bored into a rock that eventually spills into pools below. Some of us rappelled over the waterfall and swam through the keyhole, resting packs on a chockstone (a river-worn boulder jammed overhead between the walls of narrows) while swimming underneath it. Some of use chose a drier rappel that required careful crawling along a slippery rockledge to reach. Those shoes gripped where there was nothing to grab. The ledge was slick with mud and under a low overhang, so you had to crouch and crawl. But the best of the Subway was still ahead. We came to another short rappel, passed through almost tunnel-shaped narrows, where perfectly round pools and keyhole pockets were filled with water and huge froglets and tadpoles, and several more chest high swims. In one section, there was a ruler-straight furrow in the rock about 2 feet wide and four feet deep, going for maybe 30-40 feet, where the water ran through like a channel. Several small rock "rooms" were bored out alongside this channel, and one even had a person-sized doorway to the next. The water in these rooms was warm and shallow. After one more spectacular rappel (bolted) down a lovely rock face (we were getting much faster with the setups now), we crossed a gorgeous, red area where the rock spread wide and the water ran in thin rivulets over the entire area. The river widened and the walls grew taller and redder around us. And then we exited the narrows and were in regular streambed. We still had about 4 miles of rough terrain to go, and it was about 5:30. So we plowed through, crisscrossing the stream a million times, following rabbit paths and scrambling over rocks. It was a steep climb or "escape" from the canyon, and we reached our cars, roughly 9 hours after our start, at 8:30. As the sun sank, we sped all the way back to Vegas, returned the rental cars, checked in, caught another hamburger, boarded the plane filthy and smelling like the river, and arrived home at about 1:00 am. Its funny — after such a spectacular weekend, the everyday stuff, like work, seems so unimportant. I don't even really care any more — except for the money, that is. 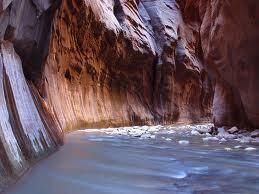 Ah, the zen of canyoneering.